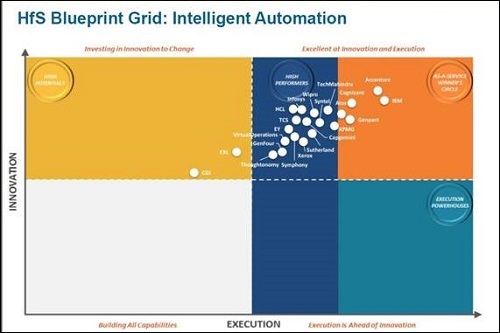 Bangalore, Nov. 16, 2016 – Accenture has been named to the ‘Winner’s Circle’ and designated as the ‘overall leader in innovation,’ ahead of all competitors, in the inaugural HfS Research’s Blueprint for Intelligent Automation. The report recognizes Accenture’s vision and investments, its tools and platform strategy and its approach to applying intelligent automation in the delivery of services, across organizational boundaries, with a focus on vertical industry solutions and business process consulting. The report is the first qualitative analyst assessment of intelligent automation, a nascent market that HfS defines as a continuum across Robotics Process Automation, Cognitive Computing, Autonomics and Artificial Intelligence. HfS projects exponential growth in this area in the next twelve months, due to broad-scale deployments and increasingly holistic automation approaches. Accenture was praised for the plug-and-play, technology agnostic approach of its artificial intelligence engine, which allows clients to harness the latest leading capabilities from across the commercial and open source ecosystem. HfS also cited the broad cognitive capabilities of its myWizard® platform, which is playing a central role in the evolution of service delivery. The report noted that the latter is by far the most compelling build out of virtual agents currently available. Additionally, clients interviewed for the Blueprint commended the company’s quality of delivery. Holistic automation strategy: The Accenture Intelligent Automation Platform integrates Business Workflow Management, Delivery Management, Intelligent Automation, and Analytics and Insights, with a neutral ERP interface at the core. This is further enhanced by the Accenture AI Engine. Strategically embedded analytics: Accenture Digital has more than 13,000 professionals dedicated to integrated analytics, essential for converting the data driven by intelligent automation into actionable insights and business outcomes. Integrated vertical offerings: Accenture is helping to drive robust and point solutions into industry offerings, such as its Claims Adjudication Advisor and Lease Abstraction Advisor that combine a virtual agent with broad cognitive capabilities. Strong collaboration with ecosystem partners: HfS noted that Accenture is building out dedicated intelligent automation practices; the strategic lever in the ecosystem is the AI Engine that allows a plug-and-play integration of disparate assets. The findings of the HfS Blueprint report were determined by data for this Blueprint was collected in Q2/3 2016, covering services buyers, service providers, and advisors/influencers in this space. The top twenty system integrators, pure-play business process outsourcing companies (BPOs), the ‘Big 4’ and leading specialist consultants were evaluated in this study. Research consisted of interviews with buyers, structured discussions with service providers and publicly available information.